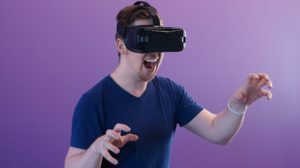 Facebook today announced the launch of a voice search feature for its Oculus Rift virtual reality (VR) headset and Samsung’s Gear VR headset. It’s available now in beta for people who use English as their primary language, the Oculus team said in a blog post. “This feature lets you perform voice searches from Oculus Home to intuitively navigate games, apps, and experiences,” the Facebook subsidiary said.